In cold weather, there is nothing more warming and comforting than a big bowl of steaming soup. Or do I mean stew? I’m not entirely sure whether this Mexican bean soup is actually a soup or stew, but with a generous amount of vegetables, beans and spicy Mexican flavours, it certainly makes for a satisfying meal. It’s especially good when served with some hearty soda bread spiked with a little smoked chilli honey. After months of grey and damp weather down here in Cornwall, we finally got a bit of winter. A couple of clear and crisp days with blue skies and sight of the sun has really recharged our batteries. This Mexican bean soup, however, is equally good on miserable wet days as it is on clear cold ones. Having enjoyed the blackberry and apple spelt soda bread I made back along, I decided to add an apple to this one. Not an authentic Mexican flavour, but hey! A little Mexican smoked chilli honey did the trick though and gave just a hint of sweet warmth and smokiness. With a load of kefir knocking around, I used that rather than buttermilk. In my experience the two are interchangeable for baking purposes. I went with 100% wholemeal spelt this time and it worked beautifully. No need for white flour at all it seems. For the soup I just fried an onion, then added some Mexican spice, black-eyed peas and a load of vegetables I had to hand. I finished it off with some of the smoked chilli honey I’d used in the bread. 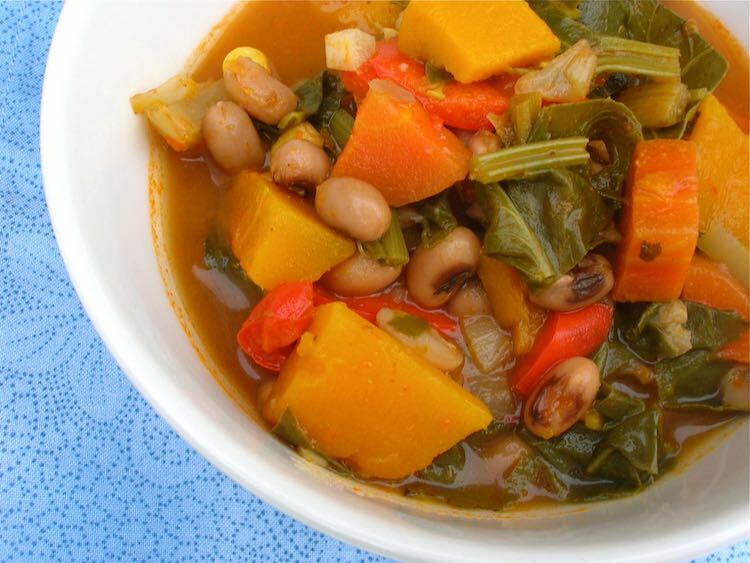 It was so good, I made the Mexican bean soup again yesterday and this time I replaced the cabbage with some sea beet greens. omitted the mushrooms and added chunks of squash and a red pepper. It was even better than the first time around. Luckily we have plenty of leftovers, so guess what we’re having for supper tonight? Easy to prepare, both Mexican bean soup and spelt soda bread combine to make a wholesome meal quicker than you can say Speedy Gonzales. Eat it for lunch or supper, it’ll be sure to cheer you up and fill you up, whatever the weather. For a vegan version, swap the honey for some smoked chilli paste or sauce. A hearty and warming soup come stew packed with tasty vegetables and beans and flavoured with Mexican spices. 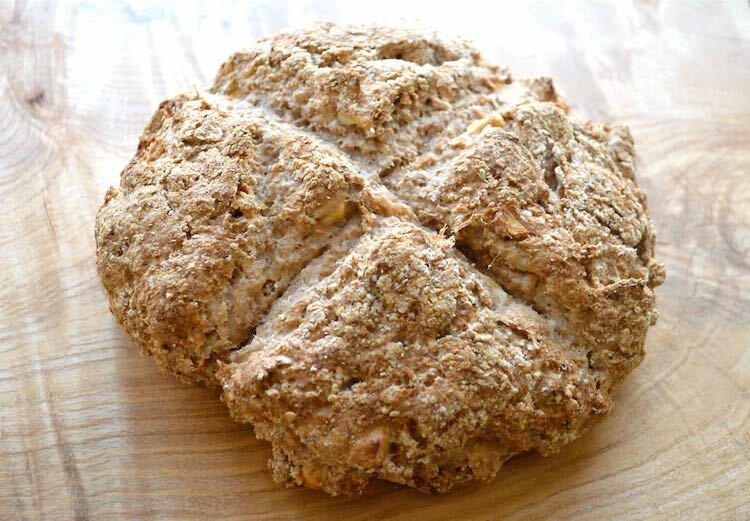 Serve with a quick to make soda bread for a filling and delicious meal. Place the dry ingredients into a large bowl and stir in the apple. Make a well in the centre and pour in the kefir and honey if using. Stir with a flat bladed knife until everything is just mixed and starts to come together. Gently bind the mixture with your hands and form into a ball. Place on a greased or lined baking tin and flatten to about 5 cm (2") in depth. Make a deep cross in the top with a large knife and bake in a preheated oven at 220C for 15 minutes. Lower the temperature to 200C and bake for a further 15 to 20 minutes or until the bread looks done and sounds hollow when the bottom is tapped. In a large pan, fry the onion in the olive oil over a medium heat for a couple of minutes. Add the carrots and celery and fry for a further 5 minutes or so. Add the spice mix and stir followed by the garlic and cabbage. Stir again and fry for a further 2-3 minutes. Add the water and tomatoes. Cover and bring to a slow simmer. Add the remaining ingredients and simmer for a further 10 minutes or until the vegetables are just tender, but not mushy. You can use whatever vegetables you like or have to hand. Adding chunks of squash and slices of red pepper, instead of the mushrooms, works very well and gives lots of cheerful colour. For a vegan version, swap the honey for some smoked chilli paste or sauce. Packed with vegetables as this is, I’m sending it off to Michelle at Utterly Scrummy and Helen at Fuss Free Flavours for Extra Veg. 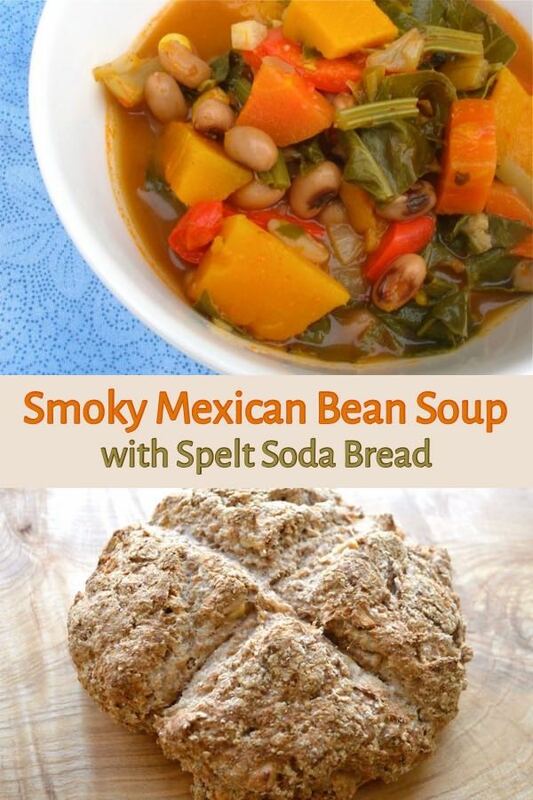 Smoky Mexican Bean Soup with Spelt Soda Bread. PIN IT. I eat soup almost everyday! 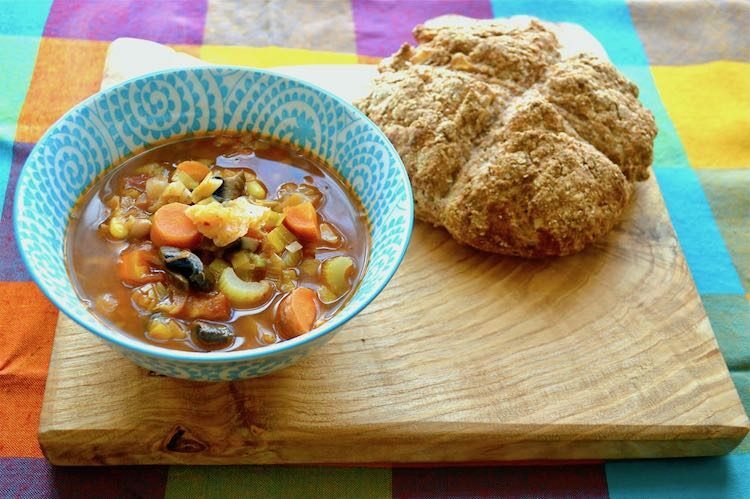 Your bean soup with my favourite spelt bread…heavenly! Thanks Natalie. If I ate this for lunch, I don’t think I’d need anything else that day. Twas very filling. That sounds delicious and very comforting too for this cold damp days. I am intrigued by the honey. Wish I had a bowl of it waiting for me now. The honey is Gran Luchito. 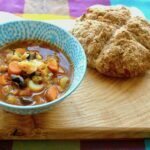 What a lovely, colourful bowl of soup Choclette, and I LOVE spelt bread, haven’t tried Mexican Chilli Honey but it sounds right up my street – delicious! Thanks Kate. The honey took a bit of getting used too, but now I’m loving it. There is truly nothing better than a hearty cozy bowl of soup! Especially with homemade bread on the side. This sounds so delicious! Perfect for these cold winter days. Thanks so much for suggesting a couple of my soup recipes as well!! Sharing! You’re very welcome Jenn and I do agree, a good soup is one of my favourite meals. Thanks Nazima. I’m not quite sure what the difference between a chunky soup and a vegetable stew is, but either way, this was delicious. The soup and the bread both look gorgeous and I love the colourful cloth too. This is my kind of meal. Love it! Thanks for submitting it to Meat Free Mondays. I was going suggest do that very thing as I’d love to feature it. Oh good, thanks Jac. I’ve had the cloth for years and it’s a firm favourite. OH is the one who makes soda bread in this house so I am going to ask him to try your spelt version. Spelt gives it a really nice crumb structure, plus as it’s a quick bread spelt is more digestible. The soup looks hearty and delicious. I do like my soup chunky as you have made it instead of pureed. Ah, that’s interesting Nayna. I sort of see a chunky soup as a main meal and a pureed one as a lighter lunch, so I like them both, but at different times. Need to find some Mexican smoked chilli honey! I adore Black eyed peas too. I love soda brad, but have never made it with spelt flour, must give it a go. I like spelt and use it in many of my bakes. I’d use it all the time if it wasn’t so expensive. Thanks Kirsty. I so need comfort food this winter, it’s done nothing but rain down here for months. Definitely need comfort food, it’s been such a horridly grey and damp winter here. Smoked chilli honey helps. Thanks CC. I find homemade bread is very hard to beat. Well that’s tonight’s supper sorted! Glad to have helped Chris 😉 It’s been our supper quite a lot lately. Thanks Heidi. Perfect for both lunch or supper, it’s a real winter warmer. That soup looks so good….. Perfect for the colder weather we are getting this week! You had me at Mexican and sold me at Smoked Chilli Honey – oh my, where do you get that? Super delicious looking soup and beautiful loaf. Thanks Janice. The honey is by Gran Luchito and according to them you can get it @BoothsCountry @Ocado @WFMLondon @SelfridgesFood @HarveyNichols @AmazonUK. Mexican flavours are wonderful Roxana. Your soup sounds very tasty too.